Cisco SG300-10 - How to set up Inter VLAN routing. I have a connection on IP 192.168.1.21, Subnet 255.255.255.0 - this is on the default VLAN1 on the switch. I need to route this to IP 10.0.3.101, Subnet 255.255.252.0 - which is set up on VLAN2 on the switch. I have set the switch to Layer 3 via console. Could someone please advise how I setup this route? I am use the Browser based interface. Re: Cisco SG300-10 - How to set up Inter VLAN routing. I know you set the switch into layer 3 mode already, but for others. i think step 6 maybe be a relevant starting point for you. But the notes in red far below are commonly neglected items. Step 2 change system mode. I personally find it easier to change the switch default layer 2 mode to layer 3 mode via a telnet session. If your USB to serial dongle works fine goto to step 4 and enter the switch console menu..
otherwise I have to enable the telnet service on the switch via the GUI. Step 3. telnet (or console) into the switch and login . Read the warning on that page as seen in the screen capture above, as the switch is reset to factory defaults, but with Layer 3 mode enabled.. The switch will reboot to factory defaults, but now we can add IP interfaces to your VLAN interfaces. and reset the device right after that. I will make ports 5 to 8 untagged in this new vlan 2 as per the screen capture below. My reasoning was that any device such as a users PC or maybe server, most likely is non vlan aware, so they expect to see untagged ethernet frames. Now now go down to IP Configuration> IPv4 interfaces in the GUI, and add a new IP address for this new VLAN 2.
a gateway address of 192.168.1.21. Remember to save your configuration , by clicking save at the top right corner of the GUI. I have set it all up as you suggest but I cannot ping from VLAN1 to VLAN2 (I'm using 2 PCs to test this). Also, does this setup allow and external device (in this case a Honeywell Modbus Client) on VLAN2 to request information from VLAN1 connection (In this case a Siemens CP443 Comms Card on 192.168.1.21, 255.255.255.0) via the IP 10.0.3.101, 255.255.252.0 as this is what our customer requires - they dont want to connect to any other devices on VLAN1. Could you expand further on the static route and gateway parts please. Thankyou for your assistance so far. Look closely at the following diagram. It roughly drawn by MS Paint, but a picture is worth a thousand words. Print the diagram below, and follow closely the story as it unfolds. IP host on switch port 7 with IP= 10.0.3.111 in VLAN 2. Lets say the host in VLAN 2 , which I will call host2 wants to 'talk' to the host in VLAN 1, which i will call host1. In general IP hosts, can onlt talk to other IP hosts in their IP network. But Host2 wants to communicate or send a packets to host1 . In other words it sends packets to the switches at IP address 10.0.3.101, and lets the switch decide how and where to forward the packet destined for host1. Host1 has a default gateway, but that is the IP address of the router, 192.168.1.1. So, when Host1 tries to communicate anywhere outside it's known network, it just forwards the packet to the WAN router , and the wan router has to make a decision as to where to forward a packet. Notice the routing table on the right side of the router. This table shows only two entries in my example. The first entry with just about all the zero's in it is called a default route.. The second Router route entry tells the router how to get to the 10.0.0.0 /22 network. to get to the 10.0.0.0 /22 network, your next hop will be 192.168.1.21 on vlan 1. Ah, 192.168.1.21 is the IP address of VLAN1 on the switch. host2 wants to talk to host 1. 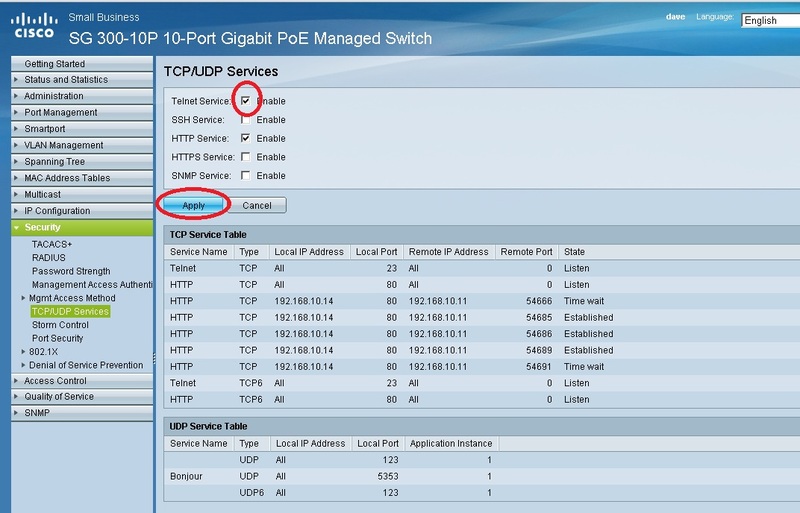 The switch then looks in it's internal route table, but it knows where the 192.168.1.0 network is, because it has a interface directly connected to vlan1. That SG300-10 switch interface has a ip address of 192.168.1.21. Ok so, the packet gets to HOST1 because the switch actually knows where host1 is. But what happens when host1 wants to reply to host2. host1 ( the PC) looks in it's built in and hidden route table , but all it has is a default gateway of 192.168.1.1. This default gateway is like the default route on the WAN router. host1 just forwards the packets from unknown sources to it's default gateway, the router. So, host1 (192.168.1.responds to host2 (10.0.3.111), by sending it's response to the router. The router looks up it route table, but it knows where the 10.0.3.0 network is. It looked through it's route table and says to itself. Oh, i have to forward the packet from host1 to my host at 192.168.1.21, because it know where 10.0.0.0 network is. The router doesn't know that 192.168.1.21 is a switch. the router lets that device at 192.168.1.21 worry about forwarding host1 response to host2. That's basically the story, and explains what the wan router should have a static route . Most routers, even domestic routers allow for the addition of a static route. I hope this story helps you and other understand the packet flow..may have to read this story a few times. This is excellent and very helpful however one more question if you dont mind. I do not have the external router referred to in your response (nor the internet connection). I only want to make sure that bi-directional communication can be possible between Host 2 & Host 1. Is this possible without additional equipment? It appears the Host 2 can get through to Host 1 OK but not the other way round. If you could clarify that would be great and thanks again for your patience. If you make host1 default gateway, 192.168.1.21, as seen in the diagram above, then both host1 and host2 (on the different vlan) will be able to communicate. note: If the process control device, communicates by broadcasting traffic within the LAN, then the broadcast will not jump normally from one vlan to the other vitual LAN (VLAN) . I can now communicate from one VLAN to another. I have 2 x Hosts also on VLAN1 which do not have default gateway input capability - I can ping them but it usually times out after 1 response maybe 2. Is there a way I can setup a route in the SG300-10 for these devices which will allow it to be reliably "pinged"? They are Bently Nevada Type 92 Communications Gateways. I was away for a couple of weeks..sorry. No need for setting up a routes..I would look elsewhere for the issue as when you create the VLAN and associate a IP address with it, a interface route is automaticcaly create when the vlan becomes active (device plugged into it). This is informative indeed! Thank you David and Gavin. I have a similar arrangement, except I have two SG300-28 switches. They are linked via GB fiber port. 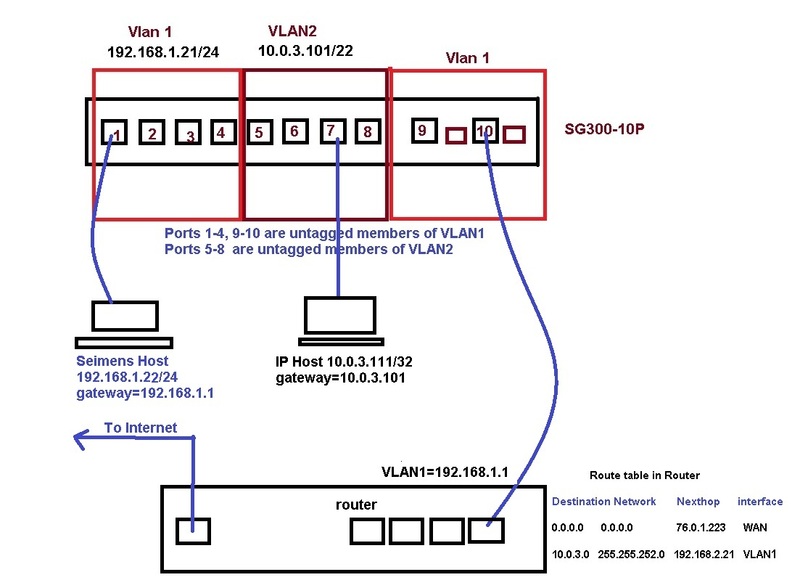 Switch 1 has one VLAN (VLAN1) and Switch 2 has two VLANs (VLAN2 and VLAN3). Existing post helps me understand how to get traffic between VLAN2 and VLAN3, but am unsure how to get traffic routed between the two switches and all of the respective VLANs. There needs to be a way to route traffic between any/all 3 VLANs. How would I best approach this arrangement? What follows is an approach you can take. You have to tell the switch how to route by manually adding static routes to tell the switch where to send packets. This interface becomes active only when at least one switchport interface is administratively up within the VLAN. When it becomes active a interface route appears in the sswitches IP route table. Ok.. so let me try to expand and explain by using the diagram from the example way above. I am connecting two layer 3 enabled SG300-10 switches together via a cat5e or even better CAT6 cable. Notice in switch two (on the right) I have assigned a IP address to the VLAN 1 interface of 192.168.1.22. I then add a static routes within each switch , telling each switch how to get to the IP networks on the other switch. 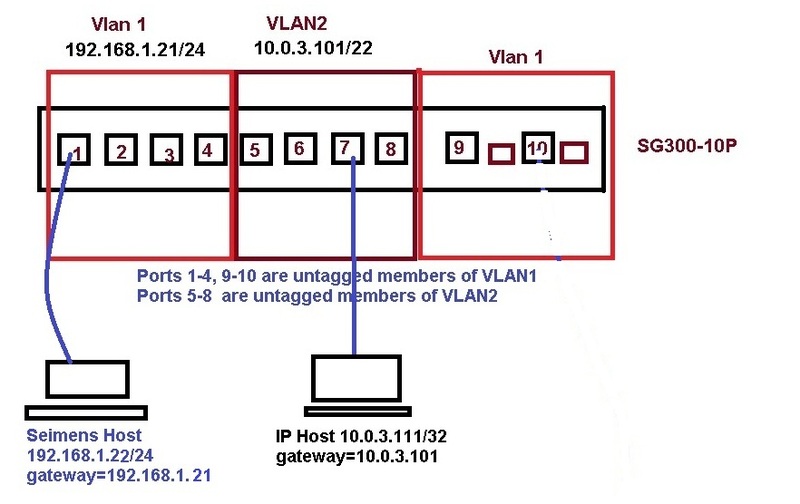 I picked VLAN 1 in my example above as all ports are untagged in VLAN 1 by default, so VLAN1 existed on both switches. Notice that on switch two, I added something called a default route that has a next hop to the IP address of Switch 1 Vlan 1 interface. This tells Switch 2, if you don't know where to send the IP packet send it onto vlan1 with a next hop of 192.168.1.21.
we may have to continue our discussion. The explanation is great, unfortunately I cannot get either of the first two scenarios to work. I have two Windows 7 workstations set up as the hosts, with their gateway addresses set to point to the respective VLAN address on the switch. The switch was originally on 1.0.0.4, and I have loaded the latest firmware 1.2.9.44, and also reset the switch to factory defaults before entering the configuration, and it still will not work. From each host I can ping their respective VLAN address on the switch, and on VLAN 1 I can ping the router, from the workstation on that VLAN. Both hosts show in the ARP table. But I cannot establish communications between VLAN's in either direction. Any Ideas, I have spent several days trying different setups with no success. Hi Richard, if you are using the WRVS4400n, you need to make a trunk port on the switch with the default vlan untagged, all additional vlans tagged. On the WRVS4400n you will need to create the 2nd vlan and do the same thing, the default vlan 1 untagged, all additional vlans tagged. If you are using the switch by itself and nothing else around, this topic answers the question. Here is what I have currently setup. Connected to Port 1 as Trunk with Vlan 1 untagged and Vlan 2 tagged. Connected to Port 7 as Trunk with Vlan 2 tagged and Vlan 1 excluded. Connected to Port 10 as Trunk with Vlan 1 untagged and Vlan 2 tagged. From Host 2, I can ping any portor device on Vlan 2. If I try and enter a static route in the router of destination 10.0.3.0/22 with gateway 192.168.1.21 it is rejected. If I try and enter a static route in the switch of destination 10.0.3.0/22 with gateway 10.0.3.111 it is rejected (Ip mask does not cover the destination address). 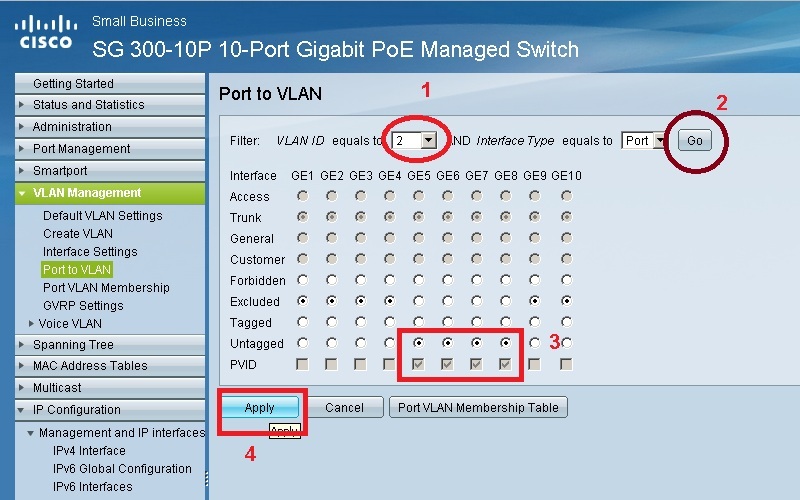 I cannot find how to create Vlan2 on WRVS4400n or how to tag or untag its ports. I tried the setup you recommended without the router, but no inter vlan communications in either direction. However in digging deeper I discovered that the switch interprets the VLAN 2 address of 10.0.3.101 irrespective of the subnet mask, as belonging to network 10.0.0.0. Note; The router is an older Linksys WRVS4400n and the firmware is different to the Cisco model. If I insert a second router on Vlan 2 and enter a static route to it on the switch, I can communicate from Vlan 1 to the second router, but that defeats the purpose of a layer 3 switch, and uses up an additional port that I need. It really is beginning to appear that this SG300 switch is not operating correctly.